First of all, I want to take this opportunity to excitedly gush my congratulations to Alejandra and Eugene. You kids are the coolest and I’ve loved getting to read all about your adventures here at Always Order Dessert. I wish you both lots of love and all the happiness in the world! Now, for those of us who aren’t off honeymooning, vacationing, resting, relaxing, and all that jazz—we’ve got cooking to do. Thankfully, it’s easy cooking. Really easy cooking. This is the best kind of cooking in my book, especially when it comes to breakfast dishes. 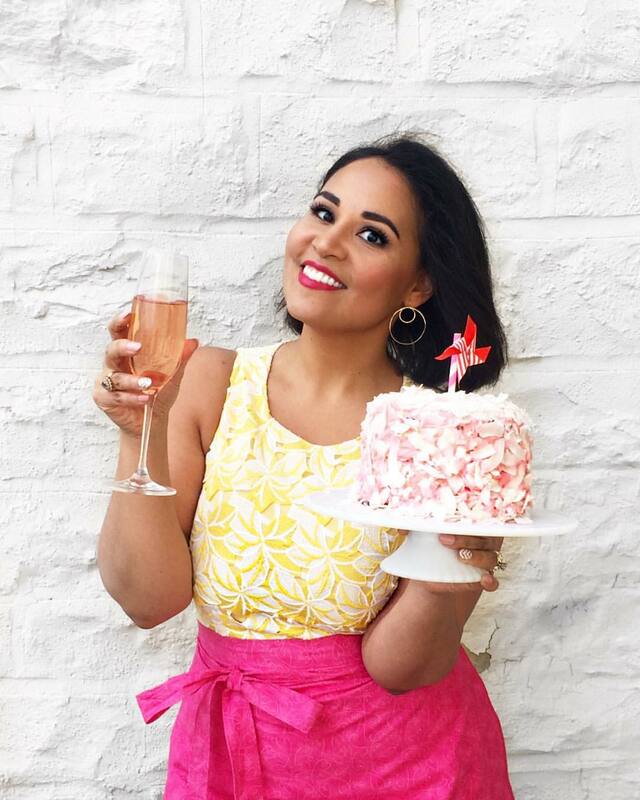 As much as I’d love to have a personal chef who’d wake up at the crack of dawn to serve me fresh brioche and cappuccino in bed, I also have to pay for college. Of course I could make my own fluffy pastries at sunrise, but that’s no fun. Sleeping in, now that’s fun! 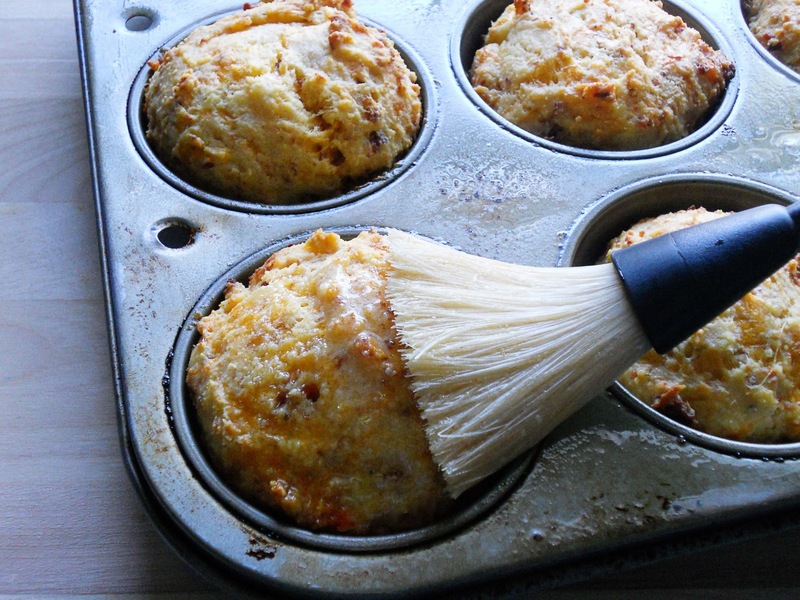 If you feel the same way, then I think you’ll really like these Bacon Cheddar Breakfast Muffins. If you’re a morning person, you’ll like them as well. Unless you love baking bread really early in the morning for impoverished college students, in which case you should send me an e-mail immediately. Regardless of whether you’re a morning person or not, these muffins make for a delicious breakfast. Rather than roll out of bed and sweat your way around the kitchen—browning sausage, flipping pancakes, and the like—why not just take a bunch of breakfast-y goodies and toss ‘em in some muffins? The formula is simple: crisp, smoked bacon plus shredded sharp cheddar, baked in a fluffy cornmeal muffin, then brushed with a heavenly blend of butter and savory spices. There’s no specific order for adding each carefully prepared ingredient that will be the deciding factor between delectable, muffin licious success and bland, hockey puck failure—it’s just a matter of mixing together some dry ingredients, adding some wet ingredients, and tossing in a few flavorful accents for good measure. Bake it all up, brush with some melted butter, and pour the coffee. Say good morning to a plate of warm, cheesy perfection. Preheat the oven to 425 degrees. 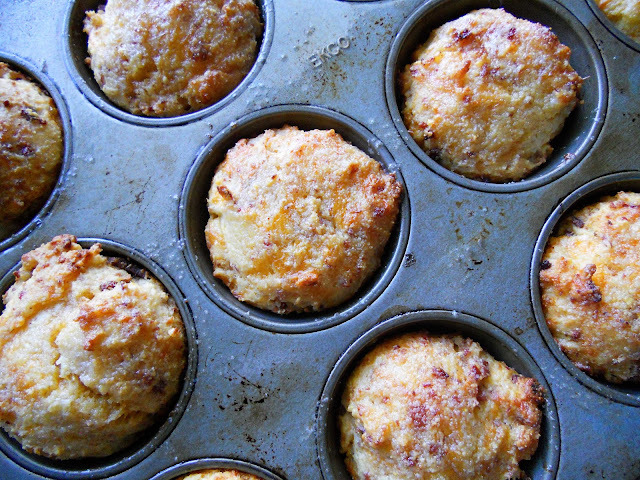 Brush a muffin tin with melted butter. In a large bowl, whisk together the flour, cornmeal, salt, baking powder, and baking soda until well combined. In a smaller bowl, mix the buttermilk, egg, and cooled, melted butter. Add the wet ingredients to the dry ingredients and stir to combine. Note: If the butter isn’t slightly cooled, it will curdle when it hits the cold egg and buttermilk. If this happens, just swirl it in a blender and you’re good to go. No harm done. Using a food processor or blender, chop up the onion and bacon until it resembles a finely crushed paste. Alternatively, just finely chop the two if you don’t want to dirty up an appliance. In fact, you could go so far as to replace regular bacon with the salad topping stuff. It’ll still taste delicious and I’ll never find out. Add the bacon and onion mixture to the batter as well as the sharp cheddar cheese, giving it a good stir so everything is evenly incorporated. Using an ice cream scoop, plop the batter into your prepared muffin tin(s) and bake for about 15 minutes, until the tops are just turning golden brown. Once the muffins are out of the oven, melt the butter in a microwave-safe bowl and stir in the spices. Generously brush each muffin with the butter mixture and serve warm.